Learn more about hurricanes from the National Hurricane Center’s Tropical Cyclone Climatology page. 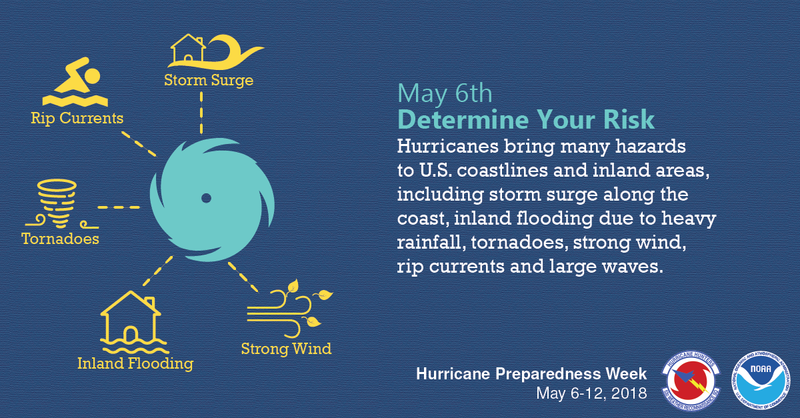 Learn more about storm surge from the NHC Storm Surge Unit. The strong winds of a tropical cyclone can cause dangerous waves that pose a significant hazard to mariners and coastal residents and visitors. When the waves break along the coast, they can produce deadly rip currents – even at large distances from the storm. Rip currents are channeled currents of water flowing away from shore, usually extending past the line of breaking waves, that can pull even the strongest swimmers away from shore. In 2008, despite the fact that Hurricane Bertha was more than a 1,000 miles offshore, the storm resulted in rip currents that killed three people along the New Jersey coast and required 1,500 lifeguard rescues in Ocean City, Maryland, over a 1 week period. In 2009, all six deaths in the United States directly attributable to tropical cyclones occurred as the result of drowning from large waves or strong rip currents. Find out more about rip currents on the NWS Rip Current Safety page. Hurricanes and tropical storms can also produce tornadoes. These tornadoes most often occur in thunderstorms embedded in rain bands well away from the center of the hurricane; however, they can also occur near the eyewall. Usually, tornadoes produced by tropical cyclones are relatively weak and short-lived, but they still pose a significant threat. Find out more about tornadoes from the NWS Tornado Safety page. Tropical cyclones often produce widespread, torrential rains in excess of 6 inches, which may result in deadly and destructive floods. In fact, flooding is the major threat from tropical cyclones for people living inland. Flash flooding, defined as a rapid rise in water levels, can occur quickly due to intense rainfall. Longer term flooding on rivers and streams can persist for several days after the storm. When approaching water on a roadway, always remember Turn Around Don’t Drown. Rainfall amounts are not directly related to the strength of tropical cyclones but rather to the speed and size of the storm, as well as the geography of the area. Slower moving and larger storms produce more rainfall. In addition, mountainous terrain enhances rainfall from a tropical cyclone. Find out more about inland flooding from the NWS Flood Safety page. Tropical storm-force winds are strong enough to be dangerous to those caught in them. For this reason, emergency managers plan on having their evacuations complete and their personnel sheltered before the onset of tropical storm-force winds, not hurricane-force winds. Hurricane‐force winds, 74 mph or more, can destroy buildings and mobile homes. Debris, such as signs, roofing material, siding and small items left outside become flying missiles during hurricanes. Winds can stay above hurricane strength well inland. In 2004, Hurricane Charley made landfall at Punta Gorda on the southwest Florida coast and produced major damage well inland across central Florida with gusts of more than 100 mph. Atlantic and Eastern Pacific hurricanes are classified into five categories according to the Saffir-Simpson Hurricane Wind Scale, which estimates potential property damage according to the hurricane’s sustained wind speed. Find out more about strong wind from the NWS Wind Safety page.